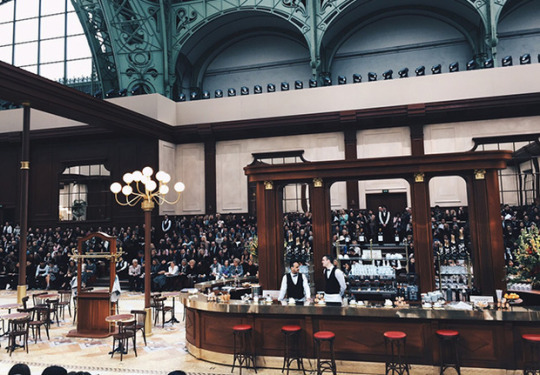 Karl Lagerfeld’s Brasserie Gabrielle, staged within the magnificent beaux-arts structure of the Grand Palais (seasonally decorated for each collection as portrayed in Simon Procter’s photographs), provided spectators the ideal ambience to experience Chanel’s 2015 Ready-to-Wear collection. It’s also the inspiration for this post celebrating the bohemian enclave and popular artist locus: the café (is the diner its American equivalent?). 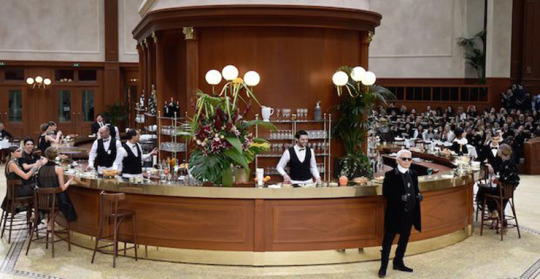 A model patron orders at Brasserie Gabrielle Source Karl Lagerfeld’s Brasserie Gabrielle, staged within the magnificent beaux-arts structure of the Grand Palais (seasonally decorated for each collection as portrayed in Simon Procter’s photographs), provided spectators the ideal ambience to experience Chanel’s 2015 Ready-to-Wear collection. It’s also the inspiration for this post celebrating the bohemian enclave and popular artist locus: the café (is the diner its American equivalent?). 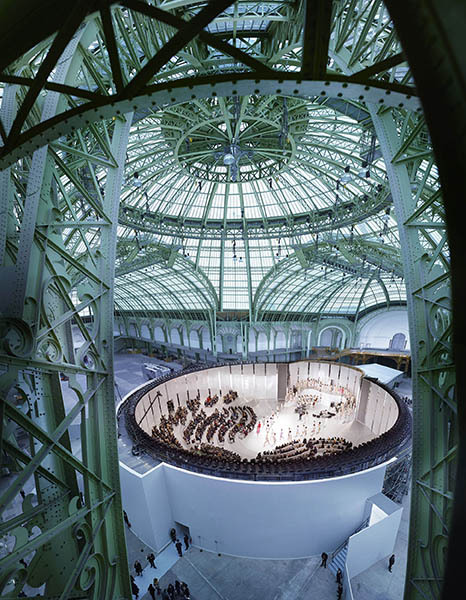 Simon Procter, Chanel, The Crucible, Grand Palais, Paris, C-print, Rosenbaum Contemporary Gallery. Click to inquire. Procter's photograph documents the evolution of Chanel's interior design takeover of the Grand Palais. 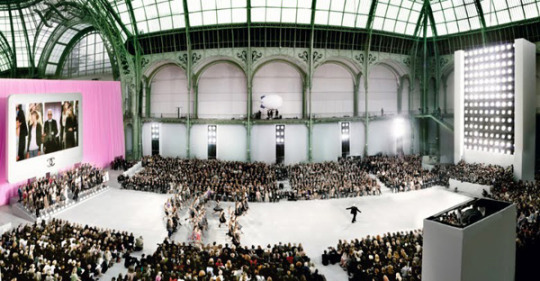 Simon Procter, Chanel Couture—Spring/Summer 2006, Paris—Le Grand Palais, C-print, Rosenbaum Contemporary Gallery. Click to inquire. Recalling the baroque eclecticism of popular 1920’s brasserie hangouts with its fabulous Art Deco furnishings, Lagerfeld’s Brasserie Gabrielle was a space transfigured to a timeless past. Models entered through a brass-revolving door to a “catwalk” of upholstered red booths lit by groupings of cream globe lamps and a central mahogany bar area attended to by waiters. 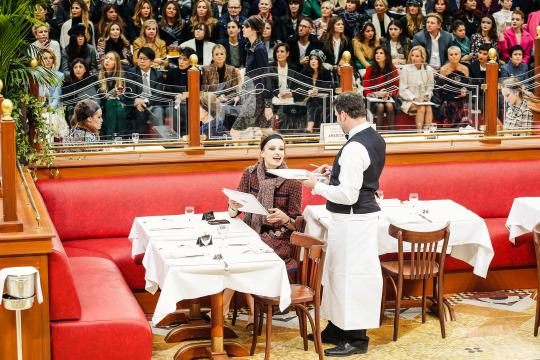 An homage to Parisian café society, Brasserie Gabrielle exuded a distinct French provenance as models nonchalantly occupied the coveted booths to be waited upon with croissants. The interior space played into spectators’ francophile fantasies of Paris’s famed “Femmes de Brasserie,” immortalized in the art historical canon with Manet's and Degas’ muses. In its resurrection of the revered French institution, the Parisian’s outdoor apartment, the interior accumulated power through its clichéd symbolism. Evoking modern brasseries with its leather and mosaic design accents, Brasserie Gabrielle and its temporary occupants were brought into a space of understated luxury and thus highlighting the clothes’ wearability. Embodying bourgeoise notions of seeing and being seen, spectators were captivated by the brasserie stage, but perhaps most notably conscious of one another. Similarly, artistic depictions of restaurants, brasseries and the like cultivate an audience’s imagination of the conversations, ideas and inspirations incubated in the café. While we’re now accustomed to bringing our laptops to work at Starbucks, Brasserie Gabrielle and other restaurants in these works confirm that cafés are still the glamorous, aesthetically quirky and universal offices to all creatives. 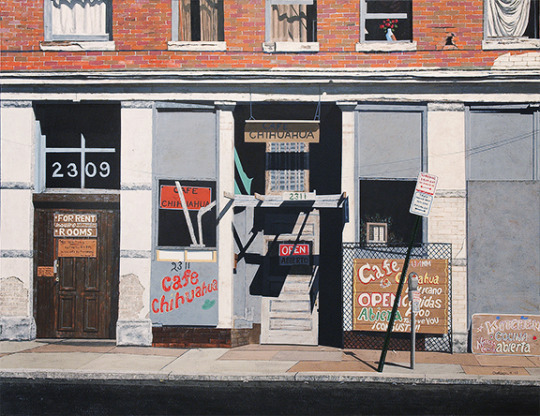 Edward S. Goldman, Café Chihuahua, Acrylic on canvas, David Cook Fine Art. Click to inquire. Imagining Goldman's Café Chihuahua as the local hangout for many. 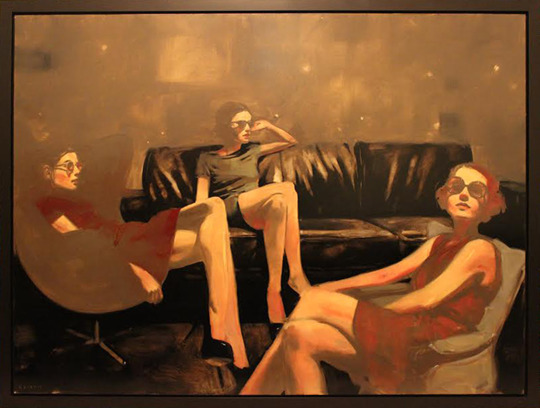 Michael Carson, Lounging, Oil on panel, Arcadia Contemporary. Click to inquire. Carson transports his audience to a chic destination. 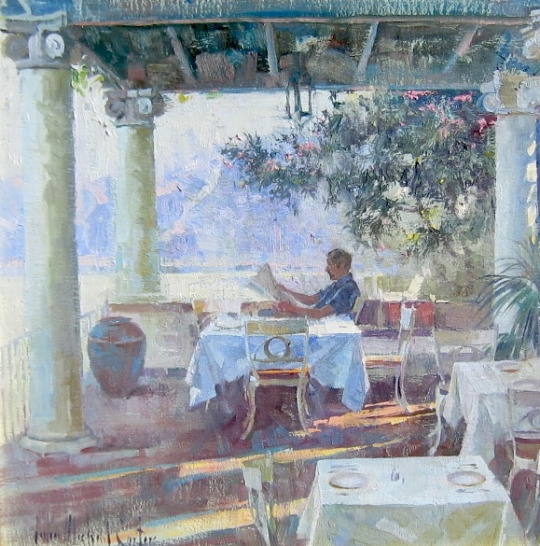 John Michael Carter, Morning in Sorrento, Oil on linen, Eckert & Ross Fine Art. Click to inquire. A more relaxed morning to catch up with the daily news. Ralph Goings, Booth Group, Watercolor on paper, Jonathan Novak Contemporary Art. Click to inquire. 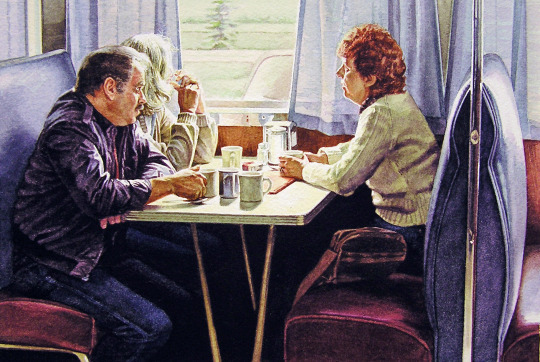 Goings' photorealistic work monumentalizes the mundane in this dining scene.